What GW games do you own or play? 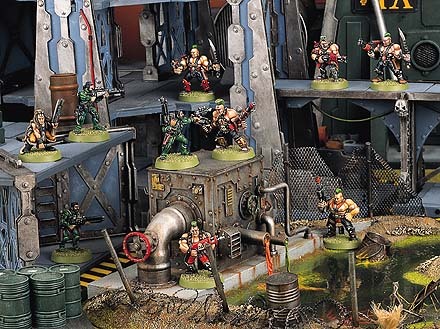 Necromunda is a game of fierce combat between rival gang fighters in the dangerous underworld of the Necromundan Hive Primus. The hives are ancient and incomprehensibly vast cities, built up, layer upon layer, stretching ten miles into the planet's atmosphere. To those who live in the depths, the dark and ruinous Underhive offers every opportunity for wealth and power. Its collapsed caverns conceal the riches of the distant past: rare and precious metals, unfathomable archeotech devices, wondrous mutated fungi and much more. It is also a place of danger, where mutant creatures, renegades and killers hide from the laws of House and Hive. And, of course, there are others who want the riches of the Underhive for themselves. Outside the hives the planet's surface is covered by endless miles of toxic ash wastes and the atmosphere is so polluted that it corrodes the hive's armoured walls. Above is a harsh sky and the sun's deadly ultraviolet light. Beyond the planet itself is the wider galaxy and the great realm of the Imperium of Man, an empire of a million worlds held in thrall by the Adeptus of Earth. But such things are nothing but legends in the Underhive where sky and space, planets and even the ground itself are concepts so wild and abstract that many refuse to believe they exist.